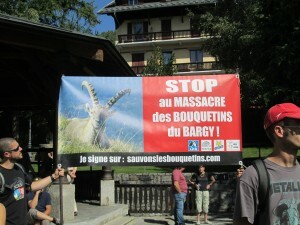 Taking advantage of Ségolène Royal’s presence at the “Grand Opening” of the Goûter hut, a small crowd of seventy people, representing several environmental associations (including Mountain Wilderness), in support of FRAPNA gathered in Saint Gervais on Saturday, September 6, to ask the minister to “stop the Alpine Ibex slaughter in the Bargy range »”. Since the discovery of brucellosis on some ibex, 320 goats over 5 years old were slaughtered on October 2013 in the Bargy range. The, remaining 300, are the ones that the associations have come to defend. But, the associations requests seemed reasonable, they wanted only the sick ibex to be eliminated. 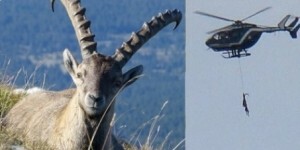 They argue that there is no need to kill them all as requested by the prefect because, they said, today there are adequate technical means to distinguish ill ibex from those that are not. They asked for an arbitration by the minister to preserve healthy animals, also arguing that the ibex, a true symbol of mountain wildlife are a tourist attraction and that their reintroduction has been long and costly. A quick decision was then expected : it came abruptly on Wednesday, September 10 : the minister had decided the final slaughter of all the Bargy Ibex. This is a demonstration of what they call democracy in France, a country who continuously gives lessons to others. In this case the minister only paid attention to those who are close to the economy. Whereas the environmentalist movements have requested a meeting with her to present scientific facts, showing that no emergency situation dictated such a rapid and final decision, that this epizootic case was not that critical and could be either cured or selected killing of sick animals was possible and good enough to take care of the whole situation, they have just been ignored. She did not even agree to have a discussion. In France, elites only talk to elites, even more so when they are supposed to represent the people.